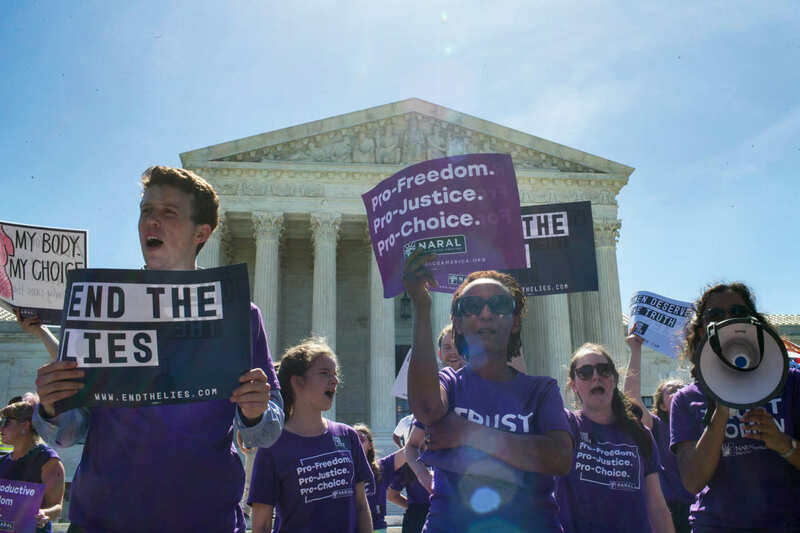 The long-standing cold war between abortion rights advocates seeking to inform women of their rights and anti-abortion advocates trying to talk women out of exercising those rights just got a bit hotter thanks to the U.S. Supreme Court. In a 5-4 decision, with the opinion written by conservative ideologue Clarence Thomas, the Court sent a challenge to a California disclosure law aimed at “crisis pregnancy centers” back to a lower court with a strong indication that the law in question violated the First Amendment rights of the centers. The 2015 law in question was basically intended to force these pro-life advocacy centers — nationally, there are three times as many of themas there are abortion clinics — to come clean about what they do and don’t do and inform the women who show up there of their other options, including state-supported contraceptive and abortion services. The lower courts regarded these disclosure requirements as involving standard medical information that didn’t trigger the tougher judicial scrutiny that protected speech enjoys. Five Justices disagreed. Thomas’ opinion carves out a very expansive notion of protected speech in a professional context that will warm the hearts of “pharmacists of conscience” and others who wish to pick and choose which duties they will fulfill. It throws into doubt not just the requirement that licensed centers disclose medical alternatives, but the requirement that unlicensed centers provide notice that they are unlicensed. The concurring opinion written by Anthony Kennedy (in which Roberts, Alito and Gorsuch joined) focused on the California legislature’s animus towards crisis pregnancy centers, claiming it represented a form of “viewpoint discrimination” the courts have always frowned upon. Kennedy actually accused California of behaving like “relentless authoritarian regimes” by targeting those with unpopular opinions. Meanwhile, Stephen Breyer’s dissent, in which the other liberal Justices joined, pretty clearly pointed to a potentially unintended consequence of this decision. He justified California’s law by examining Court precedents (especially the landmark 1992 Planned Parenthood v. Casey decision) involving state anti-abortion laws deemed acceptable by judicial conservatives. As long as the required information is factually accurate and doesn’t involve efforts to persuade women to have or not have an abortion, say the dissenters, this can’t be regarded as “compelled speech” in violation of the First Amendment. The majority’s view, Breyer suggests, could create a new avenue for restricting state requirements clearly aimed at making abortion providers make information available that they would not choose to disclose otherwise. Every Supreme Court decision touching on abortion rights is going to get a lot of passionate attention regardless of its importance. In this case, California may have gone too far in singling out crisis pregnancy centers for corrective action, though it’s hard to feel much sympathy for institutions that rely so heavily on deception (the staff in many wear hospital garb without providing any actual medical services) to lure women through their doors. But at this point, what we are mainly seeing is what happens when four Members of a nine-member Court hostile to abortion rights can find grounds for a fifth–Anthony Kennedy, whose self-perception as a defender of the First Amendmentis important to him–to form a majority. If Kennedy resigns while Donald Trump is president, we could soon see a Court that will need no such pretext to restrict reproductive rights. Kennedy’s retiring. There is no doubt where the Supreme Court is going to go on the abortion issue. It only took the GOP 50 years, but they got everything they wanted– including the Supreme Court for the next 40 years. Too bad they’ don’t know how to govern…. Five stars, by the way. Your rating stars are still missing.